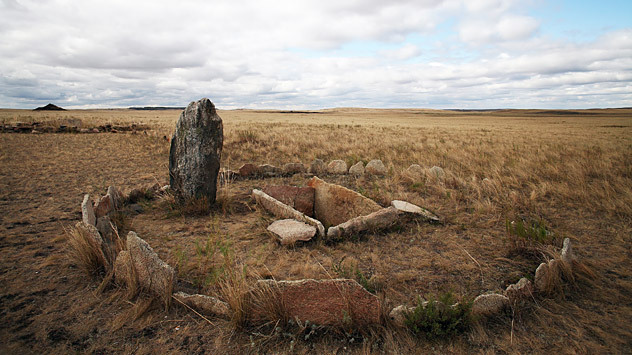 Arkaim is an archaeological complex in the Southern Urals steppe, which is dated to the 17th century BC. Source: ITAR-TASS. Ancestors of the people who settled Iran and India and founded great global cultures had their beginnings in the Urals region of Russia. In 1987, the Arkaim Valley was slated to become the bottom of a giant reservoir. A dam had already been built, and archeologists were busy wrapping up the kind of exploratory works that are always performed ahead of such operations. It was at that time that a group appeared with news of something strange in the steppe. The archeologists knew they had stumbled upon something big the moment they saw from their plane a giant figure made up of nested circles with lines radiating from the centre. The figure looked like an Indian mandala or a wheel with spokes. Later the experts began to suspect that the ancient town had been built by the very same people who had invented the mandalas – the Aryan tribes that moved into India and Iran. The scientists managed to protect Arkaim and prevent the valley from being flooded and in the early 1990s, it became clear that, 500 years prior to the Trojan War, in the times of the Egyptian pyramids and the rise of Babylon, there was a country of some 20 towns in the Southern Urals, each of which had its own breathtaking citadel. Local guide Sergei Malyutin, the youngest in a long line of archeologists in his family, grew up in Arkaim. “In the early 1990s, we had an idea that seemed progressive for that time – to create an ethno-cultural museum, an outdoor museum that would incorporate tourism, education and research,” Malyutin said. “An eco-museum is not just a building with show cabinets,” Malyutin said. In fact, in this case, the museum is the steppe around the camp itself. A few steps away from the campsite is a collection of Stone Age homes reconstructed by the archeologists. The foundation is formed by thousands of horse bones instead of stone, which has always been in short supply in the steppe. The famous caves with Paleolithic drawings on the walls were not actually inhabited, but used for ceremonies and rites. Arkaim archaeological museum complex. Source: ITAR-TASS, Lori/Legion Media. In the opposite direction from the Stone Age home is a nomad tent, or yurt, as well as Kurgan stelae and a burial mound with dummies that represent dead bodies. This is the Iron Age, the time of the Scythians. The archeological findings dating from those times always include horses (the Scythians invented the stirrup), weapons and aggressive “Scythian animal style” art. This ancient land has just as much history as Jerusalem. The only thing that looks odd on the local map is the name of the village of Parizh (Paris), which was named in honor of victory in the War of 1812, in which local Cossacks fought. There are no artifacts in the place where the ancient mandala citadel of Arkaim once stood. “You might as well enjoy standing on this ancient land,” said Zdanovich. His dream is to build New-Arkaim nearby, a full-scale replica of the citadel. Until now, the only way to study the fortress has been to use the miniature model in the museum. Two circles of defensive walls – wooden frames covered in clay. Inside, the houses abut each other and are located radially with their doors on the roofs. All the houses look the same; there do not appear to have been particularly rich or poor families. Each house has a well, and most have a smelt-furnace to make bronze from mixtures of copper and tin ore. Robust bronze gave a powerful impetus to the development of technology and culture, which is why the era is now called the Bronze Age. They made needles and fishhooks from bones, clothing from leather and fabric woven from hemp. They mostly ate cereals with meat and occasionally fish. Cattle were kept outside the citadel, between the walls and the moat. Everything is symbolic here – from ceramic ornaments to the town itself, which was all built at the same time to a comprehensive plan. But there are no drawings, no images of gods, no inscriptions. Nevertheless, the power of its legacy is proved by the fact that when one generation moved, burning the town up as they left, another generation would go back to the same spot and accurately rebuild it – every well, every post in its designated place. This happened over and over again, and there are records that they did not stay for a great length of time. “A frustrated civilization” is what archeologists call it. But sometimes it feels that “a misunderstood civilization” is a better name because of the sheer scope of the mystery that surrounds it. Even the burials are very odd – a male and a female lie together, embraced, with the female wielding a battle ax over her companion’s head. Sometimes the dead were buried in the fetal position, implying either a new birth or that death is just a dream. Zdanovich says that the Aryans came here from the west, probably from the Volga, and then moved to Central Asia. He believes that their sacred drink included cannabis boiled in milk with an addition of ephedra.